Hallmark threw a heck of a Christmas party at BlogHer last summer, with a roaring fire and a sneak preview of all the good things they had in store for this holiday season. Leave it to me to still be running late on ordering holiday cards and ornaments, even though I had six months to prepare… sigh. If you're anything like me, you will be happy to know that you can still order Christmas cards and even have them personalized, addressed and sent for you. At this late date, though, perhaps New Year's cards would be a safer option since delivery won't be guaranteed for Saturday. Use promo code HOLIDAY30 through Christmas Day to get 30% off all online Hallmark purchases. You can also send e-cards all year for one flat fee of $9.99. Of course, a big part of the Hallmark tradition is visiting your local Hallmark Gold Crown store to check out the latest in collectible keepsake ornaments, memory keeping supplies and gifts. Click here to find the location nearest you. 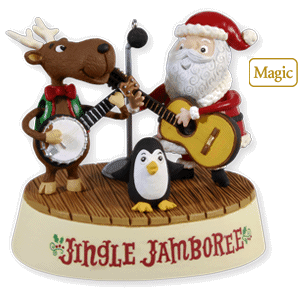 Kids love the popular characters (Star Wars, Ben-10, Harry Potter…) and musical ornaments– the Jingle Jamboree ornament shown above plays a banjo rendition of Deck The Halls that is hard to resist. 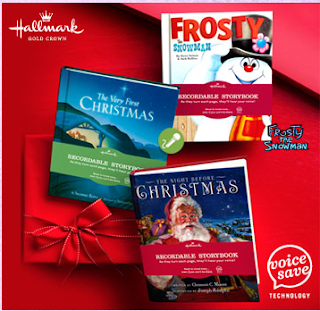 Now through Christmas Eve, all of their recordable storybooks are on sale for $19.95- a $10 savings! We have the Frosty the Snowman recordable storybook and it's absolutely adorable, especially with Roo reading it aloud. My favorite new discovery at Hallmark online is personalized paper plates. You put your own image and/or text onto a stock design for table settings you won't find at party supply stores. You can even mix and match with coordinating solid colored napkins, cups and utensils. I love this idea! And my kids are going to love the plates I've ordered for them: Star Wars for Jasper and Hannah Montana for Roo. I can't wait to see how they turn out! For more information, like Hallmark on Facebook, follow Hallmark on Twitter, or download the free Hallmark iPhone app. Disclosure: In accordance to the FTC Guidelines and WOMMA Code of Ethics, I am disclosing that I received product samples from Hallmark and they are also providing the prize for this giveaway. All opinions, however, are entirely my own. To enter and win a $40 one-time use online gift code, please comment on this post with your favorite Hallmark memory or item from their website. Entries will be accepted through December 26th and I'll pick the winner using Random.org. US readers are eligible. I love the God Has Blessed Us in 2010 card. Who can forget those Hallmark commercials where the woman looks at the back of the card--love those. I have received a few Hallmark photo cards this year and they are lovely. My favorite memory are those commercials ~ it made me want to buy all my cards from Hallmark! i like the "Very Merry Moments"
I love all of the Charlie Brown/Snoopy cards.. they always bring back memories of Christmas. I like all the Hallmark commercials -- one of the few advertisements I'll actually look at. I'd love to used the gift code to get Frosty and record it, this year. Thanks for a great giveaway and Merry Christmas. I'm mom2maya on Technorati and I think I faved you and left a review. I subscribed to rss feed with google reader. Since I'm all about saving money, my favorite Hallmark memory is using the $5. gift card found in several magazines in December. I used one yesterday, in fact! I rather like the Warmest Thanks to You! notecards for sendng thank yous!! I remember gettinga hallmark ornament every year at christmas. I love their store. My favorite is the New girlfriends mugs! I would love to win this~Thanks for the chance! I love the Hallmark keepsake ornaments. I remember when the hubby and I first got together, we'd get one every Christmas to hang on our tree.